A few weeks ago we announced optimal daily lineups for FanDuel and Draftkings. Today, we now offer optimal fantasy lineups for traditional weekly or daily fantasy leagues. We are supporting NFL,MLB, NBA, and NHL leagues. Load the Fantasy Assistant now to have a look! Optimal Lineups are very simple to use, but incredibly powerful behind the scenes. It works by comparing your starting lineup to your bench players. We list any players we think should be replaced with tons of useful stats to go along with it. We also list players who are expected to perform poorly and have no potential replacement. If this happens, we suggest using our Find Free Agents section to get a good replacement. Below is a real example from my Fantasy Baseball team. This can be an incredibly powerful tool for both weekly and daily lineups to see how your lineup stacks up against our suggestions. If you have an optimal lineup set already, then we will inform you of that. 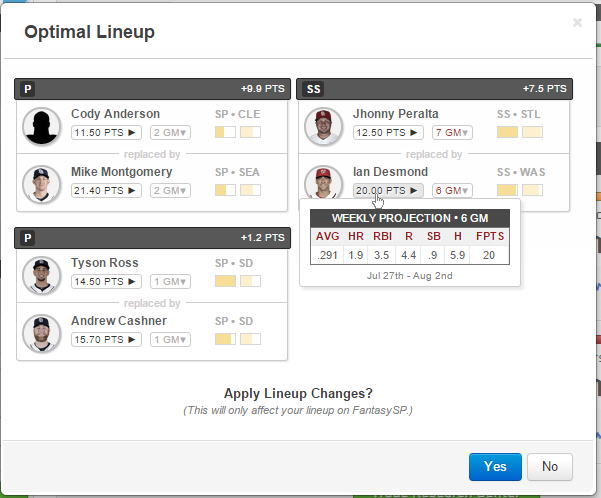 Enjoy Optimal lineups, and expect to see improvements and even more features this coming Fall.